The castle at Pickering in North Yorkshire, lays on the junction of the A169 and the A170, about 20 miles West of Scarborough. The significant remains can be found at the end of Herisson Close, a residential street at the centre of Pickering, and on the banks of Pickering Beck which runs to the West of the castle. There is a significant amount of both masonry and earthwork remains here, including curtain wall, towers, a huge impressively preserved earthen motte, and a large quantity of masonry footings and low walls. 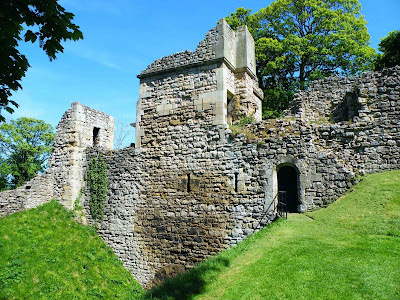 Entrance is via the Southern gatehouse, straight onto the Outer Ward which stretches to the ditch in front of you, and to your right, all the way around to the wall that separates the inner and outer wards across the deep ditch. To the left, and below the level of the Southern gatehouse, the Mill Tower still stands fairly intact. 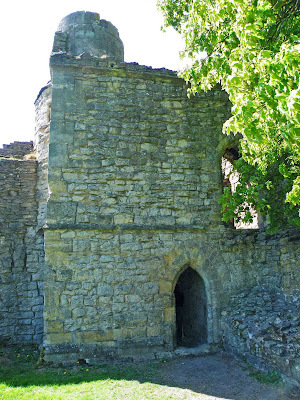 It is joined to the gatehouse by a low section of curtain wall, which has probably been reduced in height at some time. The remains of the gatehouse are also joined to the Diate Hill Tower to the East of the castle, by curtain wall, here surviving to a greater height. This portion of higher wall continues right around to Rosamund’s Tower in the North Eastern section of the castle. Immediately in front of you, the ruined shell of the Colemen Tower can be seen, with a thick wall with wall-walk climbing the steep sided motte to the summit where the King’s Tower would once have been. The motte is indeed the most impressive structure in the whole of the castle (in my opinion) Steep sided, intact and well preserved, it serves as an apt centre piece to this impressive castle. You are free to explore the whole of the castle and its attendant buildings…nothing is closed off. View of the Coleman Tower with wall-walk to the summit of the motte. The Coleman Tower straddles the Outer and Inner Wards, and would have served as a defence against intruders trying to make it into the inner sanctum of the castle. It was built around the end of the 12th century. The tower is a squat, square building, and in 1323 records show that it was being used as a prison. The tower was remodelled after this time, and a parapet was built onto the top floor. The Coleman tower would have originally butted onto the Grayss Chamber…another fortified building that would have held sway over the drawbridge across the deep ditch separating Outer and Inner Wards. A view of Rosamund's Tower from the Outer Ward, showing the attached curtain wall. 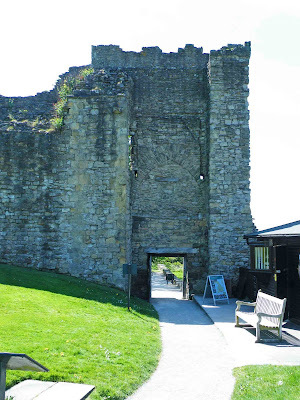 Rosamund’s Tower, at the far North Eastern part of the castle, protected the curtain wall where it met the Inner and Outer Wards….with line of site into both parts of the castle’s grounds. The upper portion of the tower was probably built for accommodation, with a room for lowering and raising the drawbridge from the postern in the lower floor of the tower. A nearby turret would have given defenders good line of site over anyone looking at breaching the postern. The outer door, leading into the Outer Ward has a set of impressively deep draw bar slots for securing the doors. The postern can be accessed from the walk that now encircles the castle. A good view of the motte, with the remains of the Coleman Tower to the left. Rosamund's Tower can just be seen to the right behind the trees. The motte would have formed the centre of the original timber based castle built by William I (Conqueror) in 1069-1070. A deep ditch, some 5 metres deep surrounds its base, with the motte standing some 20 metres tall. It’s base measures around 60 metres in circumference, and is complete and in good condition. The steep sides seem to have withstood the test of time with no slippage or damage visible. The top of the motte would have housed the King’s Tower, first timber built, and then rebuilt in stone, possibly between 1180 and 1236. The remains of a few portions of this tower still survive. Above. The gatehouse from within the castle courtyard. The gatehouse, in the Southern wall of the Outer Ward, has been virtually demolished. All that remains is the external brickwork minus most of the building beyond the curtain wall. A double door would have been hung from the jambs here, with a draw bridge over the shallow ditch. The archway that the double doors occupied can be seen when looking back at the gatehouse from the Outer Ward, now bricked up and only just visible. Some timbers are also embedded within the stonework, probably from later building periods. A barbican would have extended beyond the curtain walls, affording the castle’s occupants good lines of site for firing on any would be attackers. The North facing door of the Mill Tower, secured from the outside. The Mill Tower, situated at the South Western corner of the castle’s Outer Ward was built to protect the vulnerable corner of the curtain wall. The tower measures around 8 metres square, with the ground floor being used as a prison….the door here was secured from the outside. The floor above most likely provided fairly spacious and perhaps luxurious accommodation. The tower most likely gained its name from the horse powered mill that once existed nearby. Above. The Diate Hill tower from within the Outer Court. The Diate Hill tower stands on the West portion of the Outer Ward’s curtain wall. 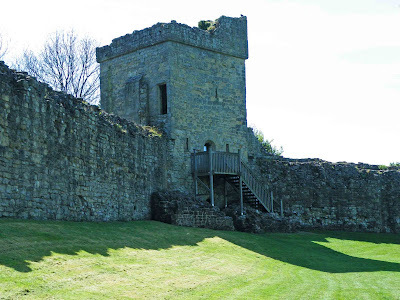 It is positioned so that it straddles the curtain wall, thereby giving the castle’s occupiers a good view of the curtain wall at a point where it turns gradually West. The 6 metre square tower is fully accessible (except for the second and third floors) A good set of draw bar slots can be seen on the internal door jambs, providing good security against unwanted visitors. The wooden access stair and balcony have been recreated to enable access to the first floor. Good views of the outer walls of this tower can be seen from the walk that circles the outside of the castle. Above. Rosamund's Tower from within the castle's courtyard. This view of Rosamund's Tower demonstrates where the Outer Ward meets the Inner Ward. There is a door in the bottom of the ditch (out of shot here) which connects with the postern in the outer wall of the tower. Anyone trying to enter uninvited here, would have faced defenders firing from above, from the flanking walls, and from the keep ahead of them. 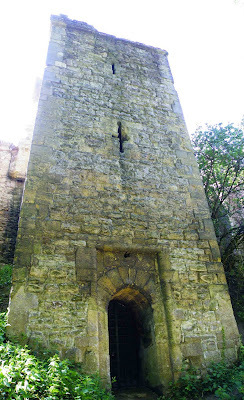 A view of the exterior postern door of Rosamund's Tower. This entrance into the castle, in the Northern wall wouldn't have been as exposed as this. Originally a draw bridge would have spanned the ditch\moat at this point, preventing access to the tower and subsequently the castle. The tower would have had battlements at its summit, and the curtain wall would have had a wall walk from which the castle's defenders could quite easily defend the wall. Check the English Heritage web site for further information.